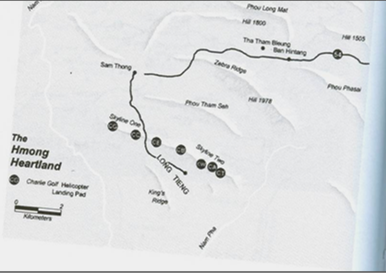 In July 1968, during the rainy season, Gen. Vang Pao mobilized his troops and moved them out to attack various targets as follows: move from Phou Khae to the town of Xieng Khouang, seize the old camp of Phou Ka Boh on top of Phou Chong Vorng mountain, occupy the town of Xieng Khouang and destroy the arsenal (37 mm anti-aircraft and several 120 mm artillery), seize tanks and enemy food supplies, and destroy the enemy troops at the Tham Kap cave. 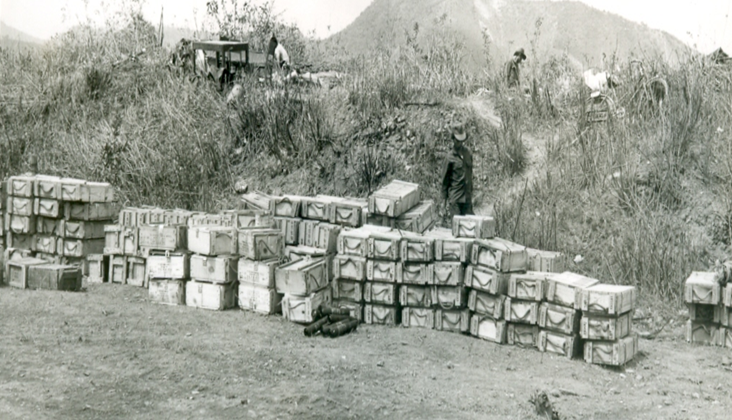 The allies killed 374 enemy soldiers and discovered sizeable amount of medical supplies hidden in the cave near Xieng Khouang airport. 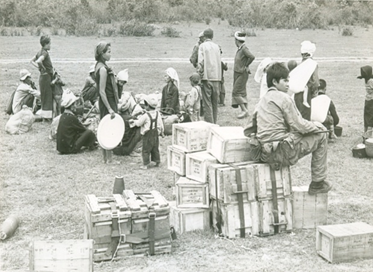 After the recapture of Xieng Khouang, Plain of Jars and Muang Soui, Gen. Vang Pao relocated about 20,000 of refugees from Xieng Khouang to Tha Lath, near the Nam Ngum Dam in Vientiane Province. He also had weapons taken from the enemy shown at a public exhibition at Long Cheng where newsmen were invited to come and see, and spread the news around the world on what the communists used to invade Laos. 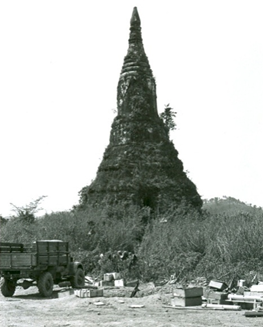 In 1968, to recapture the Plain of Jars, Gen. Vang Pao used Thai recruits to reinforce Kong Le’s troops at Muang Soui (LS108) in the defense of that town. 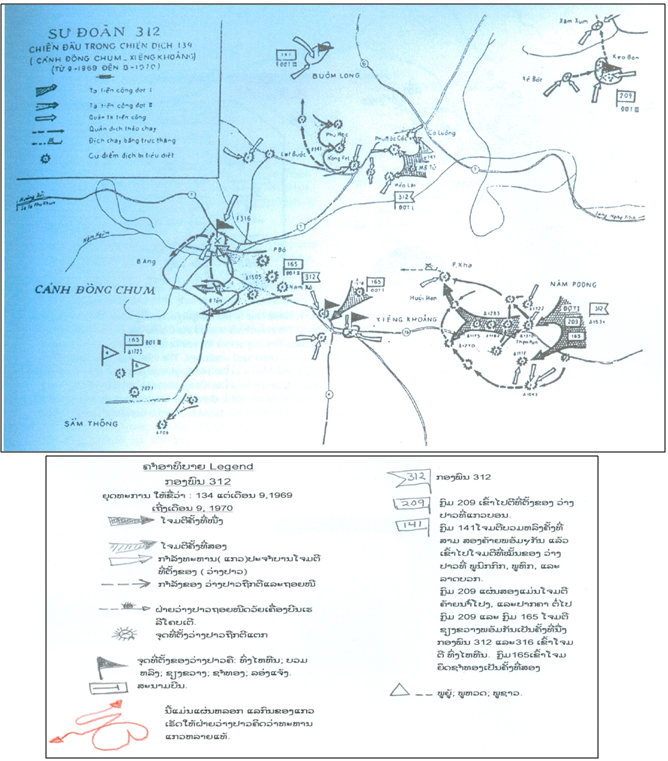 At that point, Kong Le had moved his command center to Muang Kasy (LS18), mounted an attack from Sam Thong to Phou Louang Maat, Ban Na, Phou Xeu toward Muang Phann and then the Plain of Jars. At first, the battalion that led the attack was a Lao Theung battalion under the command of Maj. Thao Lu, a former French soldier during 1950-1954. Maj. Lu was able to seize Phou Louang Maat, but made the bad decision to allow his troops to use alcoholic drinks to celebrate their victory. That same evening, while they were having fun and getting mildly intoxicated, the enemy deployed a guerilla unit for a swift attack the camp and killed the Major and 120 of his troopers. This signaled the end of the Lao Theung battalion for lack of leadership. Gen. Vang Pao deployed another army unit to replace the decimated battalion and allow it to move on to the Plain of Jars. 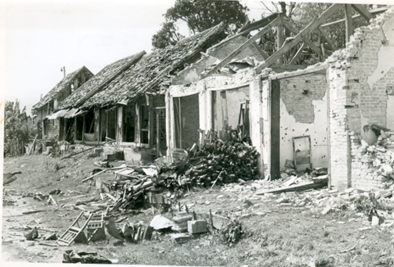 He recaptured several old posts, and destroyed arsenals and several 37 mm anti-aircraft and 122 mm artillery weapons. Gen. Vang Pao took three jars, sent the first one to the governor’s office in Samthong, the second one to the Royal Palace in Luang Prabang; and the third one to the US National Museum in Washington, DC. He also moved several thousands of Xieng Khouang residents to resettle at Tha Lath, Vientiane Province. 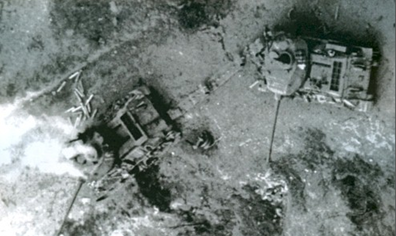 They attacked the Thai units that were defending Muang Soui. The Thai units had to retreat for lack of reinforcement and support when facing a stronger enemy force. 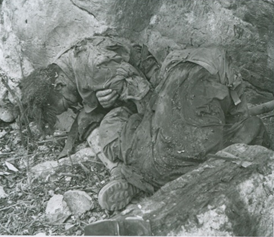 In any fight that last longer than six months and no rest, most soldiers would be tired, discouraged and have low morale. Furthermore, in this case, the enemy was equipped with better weapons, including tanks, various kinds of artillery, and rockets with a greater firing range than the allies’ rockets. 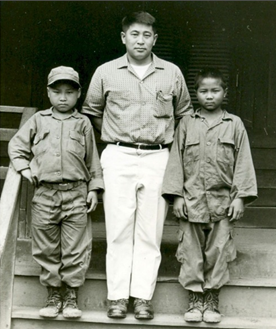 Photo #52 Col. Tom Lum and young Hmong kids dressed as soldiers, in 1968. Photo #53 (right). That Dam, an ancient tower monument located in the town of Xieng Khouang. Tom Lum was born in St. Louis, MO the son of a Chinese American. After graduation from college in 1960, he was sent to military training at Ft. Benning, GA where he got trained as parachute jumper and military pilot. Following his 1962 graduation, he was assigned to the 82nd Airborne Division at Ft. Bragg, NC and then deployed to South-Vietnam to serve for one year as propeller aircraft pilot, fighting the enemy and providing air transportation to ground troops. After his return from his Vietnam tour, Tom Lum worked as a trainer for propeller aircraft pilots at Training Center 11, Ft. Benning, GA. He later quitted his trainer job but kept his military role, and then joined the CIA. In 1968, he was sent for duties in Laos where he worked for two years as an intelligence gathering pilot and military adviser for Regiments 25 and 26 in MR-II, along with Lao officer Vang Leng. Tom Lum completed University-level military training in 1987. He retired as a Colonel in 1993 and received a retirement pension from the CIA. Photo #55. An aircraft just dropped a bomb over the Tham Kab cave (white smoke). The Xieng Khouang airfield was close by. Photo #56. 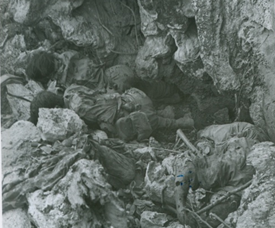 Dropping bombs on theTham Kab cave caused hundreds of fatalities to the enemy troops and offered them a good lesson. Later on, instead of using the cave as a hiding place, the enemy then just dug holes in the ground and hided in those ground holes. According to more recent news it appears that, starting in 1976, North-Vietnam has been maintaining this cave as a memorial for the 375 soldiers killed there in 1968. Photos # 59, 60, 61 and 62. 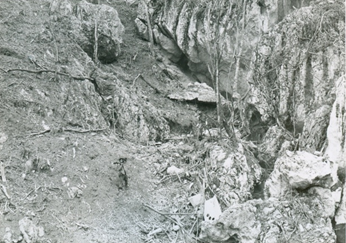 Several hundreds of North-Vietnamese troops were killed at the Tham Kab cave in 1968 due to air bombardments. 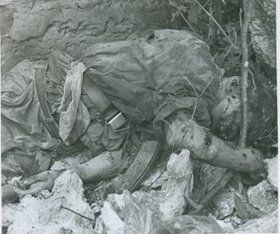 These pictures only revealed Vietnamese soldiers, no local population. The Lao PDR is using this cave as a memorial for the remembrance of the killed people – mostly the communist soldiers who died in this cave. 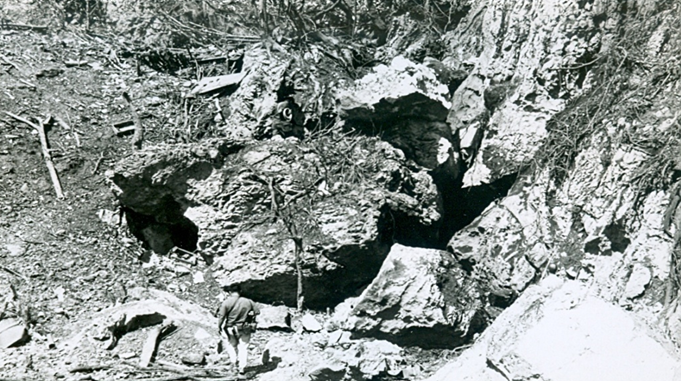 The North-Vietnamese later stopped using the cave and hided themselves in individual ground holes instead. Photo #64. BV 24 Regiment under the command of Vu May (holding a piece of white paper in his hand and wearing a red beret) on its way to attack Xieng Khouang in 1968. In 1975, he immigrated to Thailand but did not go to a third country. Instead, he decided to lead a group of refugees back to Laos and work with the Lao communists under the North-Vietnamese. He died soon afterwards for unknown reasons and under unknown circumstances in the communist hands. Photo #65. Several types of ammunitions captured from the North-Vietnamese enemy at their hiding place in Tham Kab cave near Xieng Khouang in 1968 during the Honor Recovery battle led by Maj. Gen. Vang Pao. Photo #66 Because of their badly damaged houses, the people of Xieng Khouang had no place to live and had to escape danger. In 1968, Gen. Vang Pao had to move about 20,000 people to Tha Lath near the Nam Ngum Dam, Vientiane Province. Photo #67 People were waiting for the airplanes to take them to safer places, in the flat area of Vientiane Province in 1968. Photo #68 A group of T-28 aircrafts are getting ready to move to support the allied military anytime. 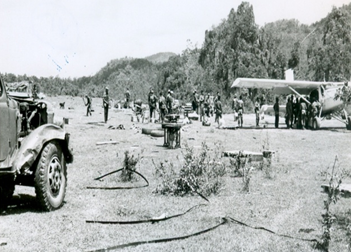 Photo #69 Xieng Khouang airfield, not far from Tham Kab Cave, which was destroyed by air raids in 1968. Photo #70. Col. Neng Chu Thao and Gen. Vang Pao welcoming H.E. 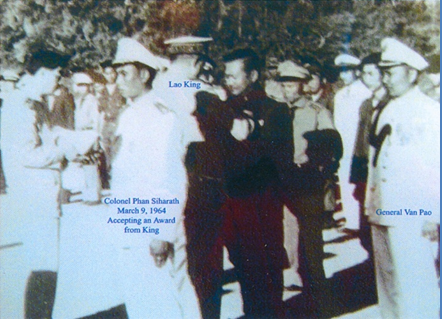 Tiao Sisouk Nachampasak during his visit to MR-II to congratulate Gen. Vang Pao for his victory at the Kou Kiat battle in 1968. Photo #71. The enemy deployed Division 312 and many other regiments to attack Gen. Vang Pao’s MR-II troops, who suffered heavy human and territorial losses, including Xieng Khouang, Ban Na, Khang Kho, Pa Dong, Phou Pha Say, Phou Louang Matt, Hine Tang and Samthong. Long Chengw as also heavily bombarded by 130 mm artillery. Photo #72 Col. James W. Lair paying visit to Long Cheng. Photo #73 Burr Smith leaning on a stone jar. 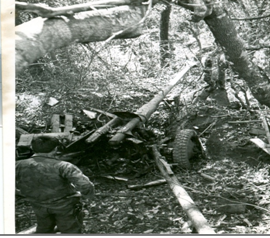 Photo #74 Destroyed Vietnamese 76 mm artillery. 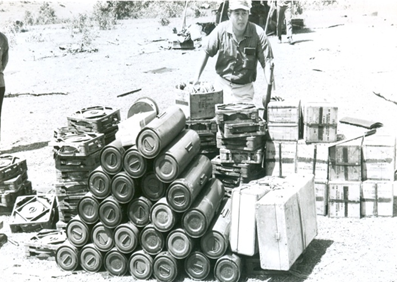 Photo #75 North-Vietnamese 82 mm and 61 mm weapons captured in 1968. In July 1968, during the rainy season, Gen. Vang Pao requested the help of several battalions of the Thai Army to assure the defense of the area around Long Cheng and Samthong. 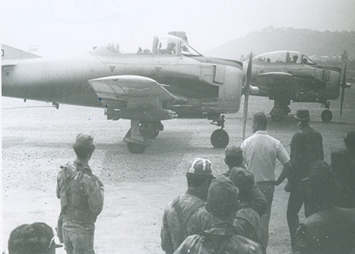 In August 1968, Gen. Vang Pao sent two regiments by air to Houei Tong Khorr to push the enemy toward Phou Pha Thee, encircled and attacked it with air support from the US and T-28 aircraft from the Royal Lao Air Forces to recapture Phou Pha Thee. The fighting reached the top of the mountain but could not proceed further because the enemy put in place formidable, ready-to-fight-to-death defense units along the uphill trail. 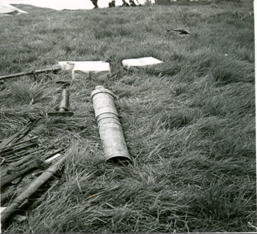 Several anti-aircraft weapons were also in place at the top of the mountain, firing continuously to prevent helicopter landings. Several helicopters did get shot and one jet aircraft was shot down. 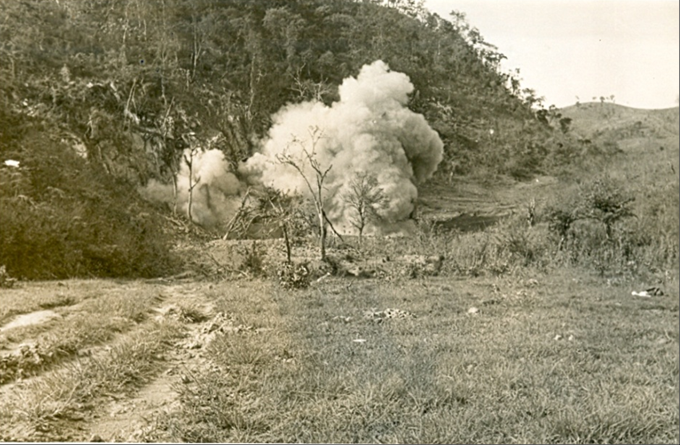 This fight to recapture Phou Pha Thee was not successful because the enemy was stronger and capable to fire at the allies from all directions and at the same time. All the posts that were recaptured were soon seized back by the enemy. The enemy extended its cleansing operation to Na Khang (LS36), the command center of the Houaphan military sub-region. 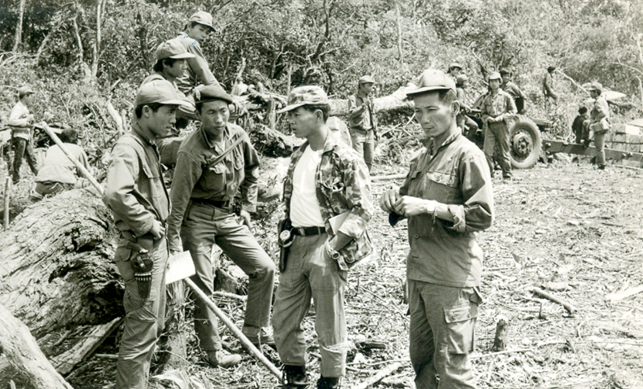 Using an impeccable siege and heavy attacks, they seized Na Khang Camp in February 1969, gained full control of Houaphan Province, and caused the death of a very important military officer in Na Khang Camp, Col. Phanh Siharath. 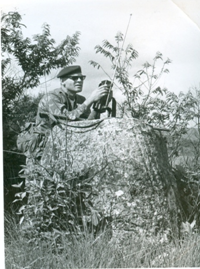 Civilian advisor: Pop Buell was the coordinator for all equipment, food supplies and basic tools needed by refugees to survive after they have lost everything. Civilian advisor: USAID staff as usual until May 14, 1975. Starting in 1970, Jerry Daniels was the US military advisor. Once the three Lao factions agreed to form a joint Lao government, US assistance was redirected to post-war development, e.g., agriculture, livestock, and mining in MR-II. 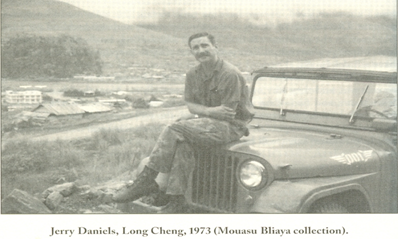 From May 15, 1975 to 1982, Jerry Daniels was in charge of MR-II refugees resettled in Thailand. He died at his Thai residence in 1982. 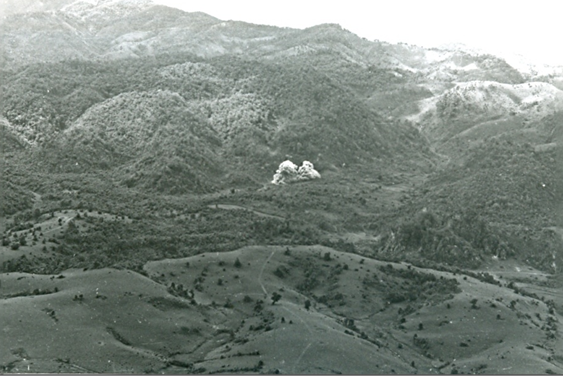 On July 23, 1963 the Lao neutralist forces combined with communist North-Vietnamese troops attacked the camps of Phou Pha Xay and Khang Kho (LS204) –the village of Chaomuang Yuatong Yang. Lt. Col. Vang Pao deployed forces to recapture those two bases. He was promoted to the rank of Colonel of the Royal Lao Army and then became the commander of MR-II until May 14, 1975. Photo #77. 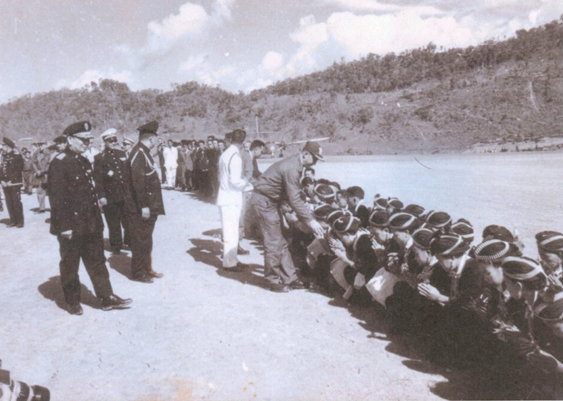 H.M. King Sisavang Vatthana conferring medals to MR-II high-ranking civil servants and military officers at Long Cheng in 1965. Col. Phan Siharath was shown in the middle, next to Chaokoueng Chao Saykham (in black suit). Photo #78. 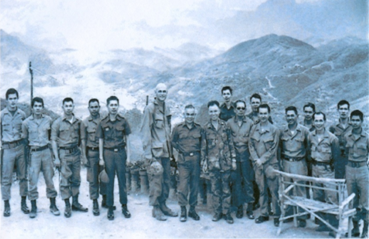 Thai Army Officers, Burr Smith and Gen. Vang Pao at Long Cheng in 1968. 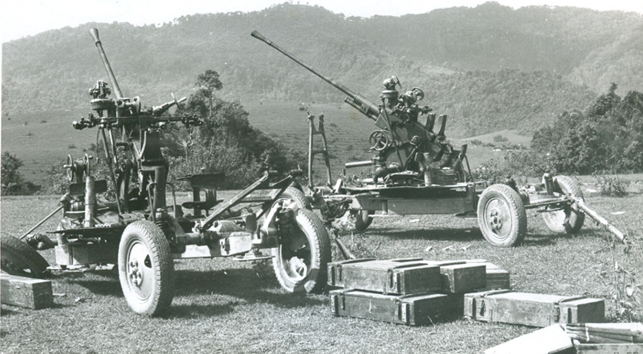 In 1963, Lao neutralists and North-Vietnamese attacked Pa Dong (LS05), Khang Kho (LS204) and Phou Pha Xay, and captured Khang Kho and Phou Pha Xay, while still shelling Pa Dong with heavy weapons. This led Col. Vang Pao to start a new base at Phou Pha Khao (LS14). He was then promoted to the rank of Brigadier General of the Royal Lao Army. In 1964, realizing that the Phou Pha Khao’s runways were too short and too dangerous for the pilots at take-off and landing, BG. Vang Pao took US experts with him to Long Cheng to look at the feasibility of building an airbase at that new location. With the US experts’ green light, he then had the construction of the new airport started in 1964 and named it L20A. Photo #79. 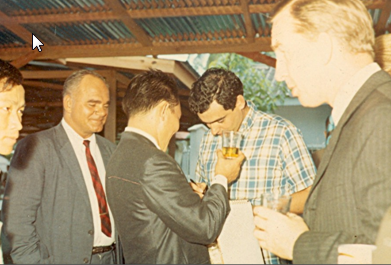 Pat Landry (with red necktie), Vang Geu, and Vince Shields (CIA, signing a letter) at Long Cheng in 1970. The Long Cheng airbase (L20A) was located in Xieng Khouang Province, half-way between Xieng Khouang and Vientiane Provinces, and north of the Nam Ngum Dam. The flight between Vientiane and Long Cheng took about 30 minutes. Long Cheng is south of the Plain of Jars and only 15 minute flight away. 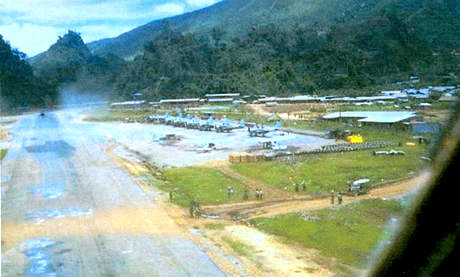 The airport was about 500 meters wide and 1,500 meters long, with a total surface area of 750,000 square meters limited by three mountain ranges –Middle Long Cheng or Long Cheng Airport, North Long Cheng or United Lao Radio Station, and South Long Cheng or Long Cheng to the east of the Lao Theung ethnics. Note: During the recapture of Phou Pha Say, battalion commander Capt. 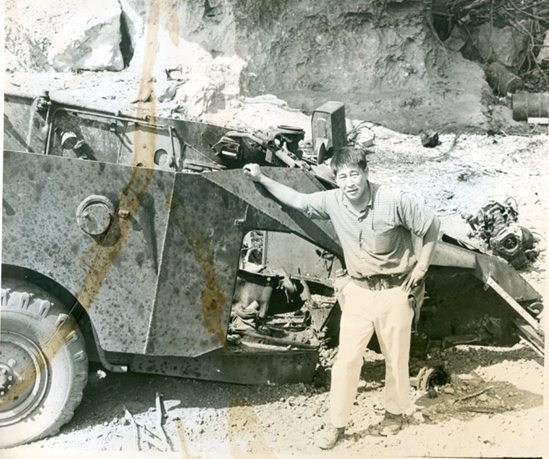 Naoheu Vang was killed by the enemy in September 1964. 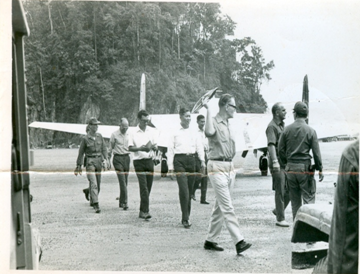 The various Lima sites that provided reference points to pilots included the following airports: Wattay (Vientiane L08), Muang Kasy (LS18), Muang Hongsa (LS65), Nambak (LS54), Long Cheng (L20A); Samthong (LS20B); Plain of Jars (LS22); Muang Soui (LS108); Na Khang (LS36); Bouam Long (LS32); Phou Koum (LS50); Sanh Chor (LS02); Muang Mork (LS46); Muang Chaa (LS113), a station that changed its name to Muang Desa when the Lao king visited it in 1970, and then to Muang Xaysomboun (current Lao PDR name); Phakhao (LS14); Padong (LS05); Khang Khor (LS204); Ban Na (LS15); Ban Hinh Tang (LS74); Namfene (LS224); Phou Hae (LS255); Phak Khae (LS353); Phou Kang (LS337); Phou Sanh (LS240); and Muang Phoune (LS37), the village of Chaomuang Touxia Tao. The big sign above Phou Mork from west to east read as follows: CG, CC, CE, CB, CW, CA and CT (which stand for Charles George; Charles Charles; Charles Echo; Charles Bravo; Charles Wisky; Charles Alfa and Charles Tango). The highest peak to the west was called Skyline One, and the highest peak to the east, Skyline Two. 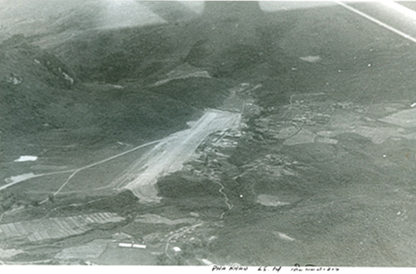 The peak east of the Long Cheng airbase was named Appolo. East of Long Cheng airbase was the Long Cheng Tai or Ban Lao Theung, and a stream flowing to the west, called Nam Ngoua Creek. The whole mountain range north of the Long Cheng airport was the Phou Mork range. The lower hill south of the Long Cheng airport was named Phou Phra Rassavang. Based on the above, the airport was located in a valley; and one could only take off or land here by flying in from the east. A mountain range formed the airport’s west end. In 1962, the three Lao princes decided to form a tri-party government to bring peace to the Laos kingdom. This development gave every Lao citizen great hope for peace and no more war. Gen. Vang Pao laid out post-war reconstruction plan for MR-II, focusing on construction, road repairs, public health, education, and management. He built new offices for provincial and district management, a new hospital, and a new school for provincial Governor Chao Saykham Southakakouman. He also built a royal resort for use by the king during his field visits to the Province. 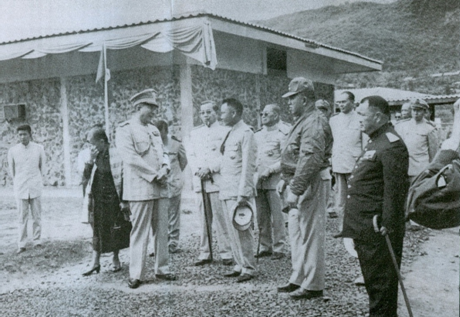 Once the building construction was completed, the General invited King Savang Vatthana to visit MR-II during 1965. The king then promoted BG. Vang Pao to the rank of Major General and conferred him the honorific title of Phagna Nora Pamok (The Courageous King Lion). Soon afterwards, the situation changed drastically when the Neutral Party was divided in two neutralist factions, one led by Kong Le and one led by Deuane Sounenarath. Communist North-Vietnam fought the Kong Le neutralists and the Vientiane rightists. This led the US to increase its air strikes over several targets in Laos, causing a scary development because North-Vietnam was mobilizing massive military forces in northern Laos, Phongsaly, Houaphan, Xieng Khouang, and in MR-III, MR-IV in southern Laos. Photo #86. 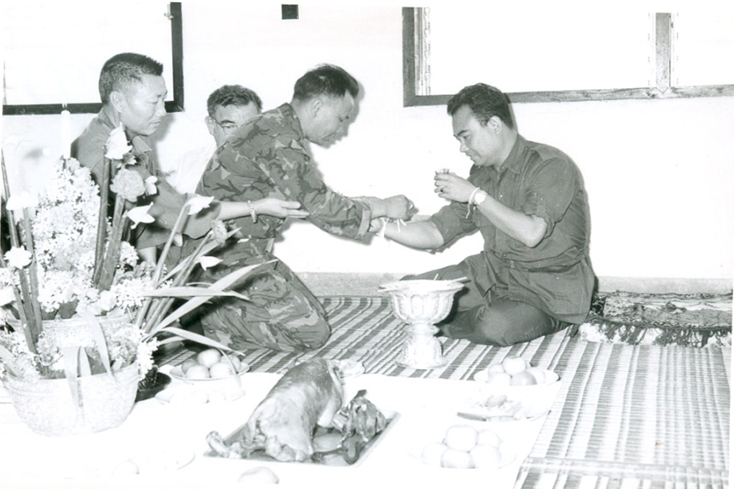 H. M. the King during a visit to MR-II in 1970 to celebrate the Hmong New Year after the second recapture of the Plain of Jars. This was his last trip to MR-II. Photo # 87. 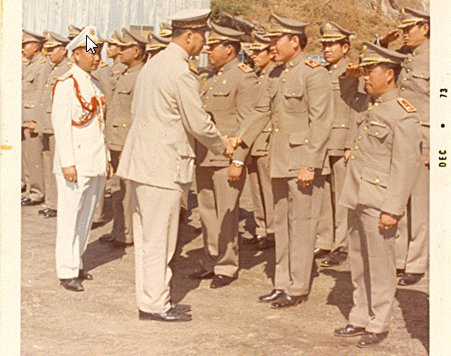 The Laos Crown Prince on his visit to Long Cheng in 1973, being welcome by high-ranking MR-II military officers (shaking hands with Col. Vang Geu and followed by Gen. Vang Pao). He never left the country and was detained at a re-education camp where he died. Communism is a regime that destroys monarchy.